Cybergenica Founder and President Daniel St.Pierre is first and foremost a student of the Word of God. On occasion, Daniel dabbles in Internet marketing strategies and website marketing methodology.Since 1985 Daniel has participated in over One Thousand and Two Hundred (1,200) internet, television and radio shows as well as print interviews to news outlets worldwide, both in English and French. Described as a powerful, faith driven inspirational speaker, his audiences testify speaking events conducted by Daniel are informative and in some cases, life changing. Covering a wide range of subjects from Internet Marketing 101 to Advanced Interactive Ebusiness Solutions, Daniel’s presentations feature the utmost in measurable data and internet technologies. His accomplishments and creative advertising pieces have been featured in Popular Science Magazine, the Orange County Register, the Montreal Mirror and the Aliso Viejo News, to name just a few. Daniel’s engaging presentations utilize data and statistics drawn from The Washington Post, E-commerce Times, Business Week Magazine, SearchEngineWatch.com and Website Magazine. Daniel St.Pierre is the sole owner of numerous ebusinesses which include Glorious Media, an award winning web production company, the National Motivation Network, a nationwide motivational service, The Ponce Foundation, a Christian market research company and many more. 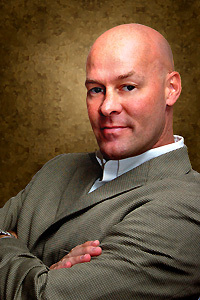 As a breakout session speaker, custom session presenter or keynote speaker, Daniel St.Pierre is a clear choice for your event ensuring passionate, content rich delivery. You are invited to inquire with Customer Support for details about booking Daniel St.Pierre for your event. “Speaker introduction” during which he introduces himself and shares his background information. “3 Website Musts“, key elements of any successful website. “Top 20 ROI Maximizers“, a descriptive top 20 list of top website marketing techniques. A 10-15 minute “Question Period” when answers to web marketing questions are provided as part of the presentation. How do I book Daniel St.Pierre? We invite you to contact us by phone at 727.674.5681 at which time we will discuss the opportunity you propose and set our fee according to the terms of an agreement. All presentation engagement fees must be afforded in full prior to the event. Travel expenses will be billed after the fact and/or according to the terms of our agreement.